License, permit, and issuance fees and exemptions are established by the Legislature. In addition to the cost of licenses and permits specified in this section, license agents charge issuance fees for selling licenses and permits. For up-to-date license information, visit MyFWC.com/License. 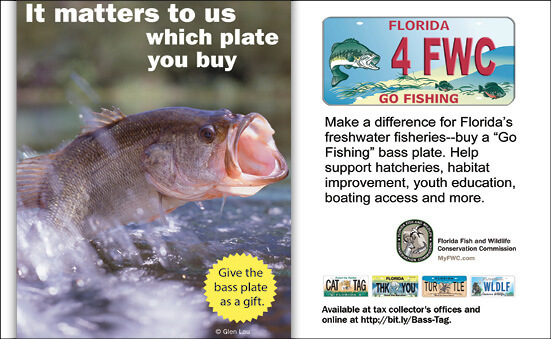 Anglers may use credit cards to purchase licenses and permits 24 hours a day at GoOutdoorsFlorida.com or by calling toll-free 888-FISH-FLORIDA (347-4356). This enables anglers to obtain and use licenses immediately. Handling fees will apply on all Internet and telephone sales. License sales are nonrefundable.Licensing requirements follow the species of fish you are fishing for, regardless of where you are fishing. Please see the “Frequently answered questions” for more information. For fishing license exemptions, please see License Exemptions, but remember anyone can buy a license to contribute to conservation. For purposes of fishing in Florida, a “resident” is defined as any person who has declared Florida as his or her only state of residence as evidenced by a valid Florida driver license or identification card with both a Florida address and a Florida residency verified by the Department of Highway Safety and Motor Vehicles (HSMV). If the person does not have a Florida driver license or identification card on record with HSMV, a Florida voter information card, declaration of domicile, or homestead exemption may be used as proof of Florida residency. Active military personnel stationed in Florida, including their spouses and dependent children residing in the household, are considered residents when purchasing fishing licenses. Available at county tax collectors’ offices with current military identification card for Florida residents who are active duty or fully retired members of the U.S. Armed Forces, Armed Forces Reserve, Florida National Guard, Coast Guard or Coast Guard Reserve. Fully retired veterans may renew online. Lifetime licenses are available to Florida residents only. Funds generated from sales of these licenses are invested, creating an endowment to support long-term conservation of Florida’s fish and wildlife resources. Costs of lifetime licenses are less than what would be spent on annual licenses, permits and fees, and are valid in Florida even if you move out of state. When you buy your license online, it’s fast, convenient and saves time and travel. Download the FWC Fish-Hunt-FL app for your iPhone or Android for instant access. You can obtain a license 24 hours a day at GoOutdoorsFlorida.com and begin fishing immediately! Licenses are also available toll-free at 1-888-FISHFLORIDA (1-888-347-4356). Processing fees apply to telephone and Internet sales.